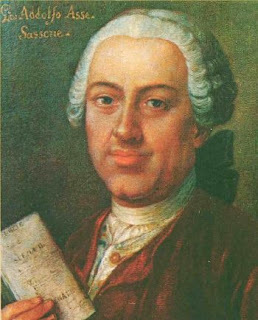 Today's Composer of the Day is Johann Adolf Hasse. Hasse was an accomplished and prolific composer. He wrote a great number of operas. Like, really, a lot of operas. And cantatas, too. Lots of them! After his death, he was largely forgotten. Today, Hasse is largely forgotten. His music's assimilation of Baroque contrapuntal styles and Italian opera techniques result in an interesting synthesis. For this reason I kind of think of him as a missing like between the Baroque and Classical eras. His music is recently being performed and recorded again. Here is some video of his music being performed, by musicians. Sort of. Seriously, I'm trying to procrastinate here! Also, I just noticed, in the fun to look at picture, that Italian for "Hasse" is apparently "Asse." That is hilarious.